Anatomy educators are increasing their utilisation of radiology in anatomy education in line with clinical need. The aims of this study were to integrate radiology into anatomy practicals delivered to first year medical students at our institution. The study took place over a four week period during thoracic anatomy sessions taught to first year medical students. Self-directed radiological presentations were uploaded to monitors at each station. During practicals, students rotated between radiology, osteology/plastic models and cadaveric material. Radiology content was taught in practical sessions by doctors with clinical radiology experience. Radiological presentations pertaining to X-Rays, MRI, CT, and angiography were successfully integrated into anatomy practicals. In this poster, we demonstrate a transferrable model for integrating radiology into anatomy practical sessions in a time efficient manner. This functional approach to amalgamating radiology into thoracic anatomy teaching without placing further stain on existing anatomy resources will enhance thoracic anatomy and radiology knowledge amongst undergraduates thereby reacting to clinical need. 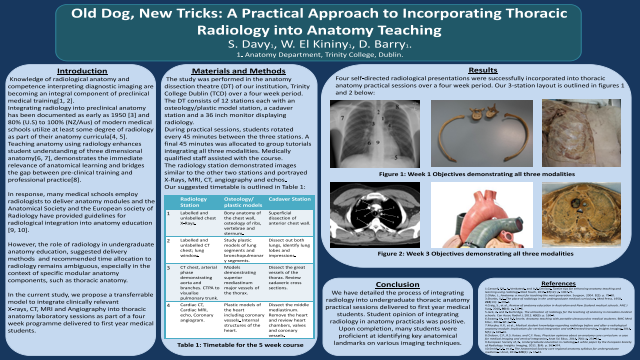 Summary: In this poster we detail a practical approach to incorporating radiology into a thoracic anatomy course delivered to first year medical students.References: Caswell, F.R., A. Venkatesh, and A.R. Denison, Twelve tips for enhancing anatomy teaching and learning using radiology. Med Teach, 2015. 37(12): p. 1067-71. Older, J., Anatomy: a must for teaching the next generation. Surgeon, 2004. 2(2): p. 79-90. Shanks, S.C., The place of radiology in the undergraduate medical curriculum. Med Press, 1950. 224(13): p. 291-3. Craig, S., et al., Review of anatomy education in Australian and New Zealand medical schools. ANZ J Surg, 2010. 80(4): p. 212-6. Jack, A. and B. Burbridge, The utilisation of radiology for the teaching of anatomy in Canadian medical schools. Can Assoc Radiol J, 2012. 63(3): p. 160-4. Swamy, M. and R.F. Searle, Anatomy teaching with portable ultrasound to medical students. BMC Med Educ, 2012. 12: p. 99.